The Kenworth Trucks Cummins ISMe5-powered T403 has had a facelift to go with its selective catalytic reducation technology, proving it a versatile number for both town and country. Matt Wood reports. Morwell-based Dyers Gippsland Transport driver Cameron Both kindly let me test his aero-styled Kenworth T403. The set-back steer axle T403 conventional launched last year continues in the same vein as its predecessors, the T401 and T402, as a mainly single trailer (though 19m B-double capable), urban and intrastate prime mover. The T403 fills a gap in Kenworth model range between the vocational T359 and the heavier spec T409 and T409 SAR. What is new about this particular T403 is the selective catalytic reduction (SCR) ISMe5 Cummins hiding under the bulbous snout of the day cab prime mover, to date Cummins have been sticking with exhaust gas recirculation (EGR) to meet our stringent Euro 5 (ADR #80/03) emissions laws. The SCR versus EGR debate got a tad emotional in the United States a while back. With some advocates of EGR blaming the diesel exhaust fluid (DEF) used in SCR engines for all manner of ills from birth defects to various forms of cancer. It was getting to the stage where I was actually expecting someone to claim that DEF was responsible for JFK's assassination. Ironically, it was actually a US company, (Englehard Corp, now a part of BASF) that first patented the SCR process way back in 1957. Cummins, which uses EGR in its highway engine range, has, however, been quietly tinkering with SCR for a while in Europe, having had SCR engines on the market there since 2006. Cummins has admitted that there will be no other option but to use SCR combined with EGR across their engine range to bring them up to scratch for the next round of emissions legislation. While Euro 6 (ADR #80/04) is a while away yet for the Australian market, Cummins has already released some smaller capacity Euro 5 (ADR #80/03) SCR engines with the 10.8-litre 380-440hp (280-324kW) ISMe5 being the most recent (and largest horsepower) addition to the Aussie market. 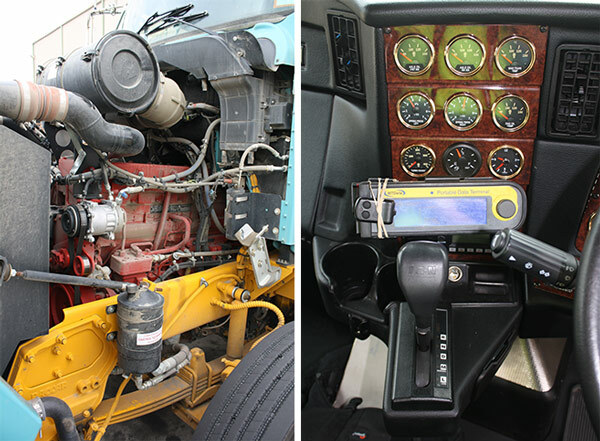 The Kenworth T403 features an Eaton Fuller 18-speed UltraShift Plus AMT. It, in conjunction with the Cummins, made life easy but some down sides of the lack of a clutch pedal on the self-shifting transmission soon became apparent during my test drive when the time came to back onto a loading dock or to hook up to a trailer. If you pull up, say 300mm, short of a loading dock while reversing, it can be difficult to close the gap without the truck lurching backwards as the clutch engages. I found myself wincing with anticipation as I tried to gently bring the engine revs up enough to get the clutch to disengage and get the trailer firmly on the dock. Hooking up to a trailer was a more delicate operation; as I backed the turntable under the trailer skid plate, it was a juggling act on the throttle to prevent any impact between the turntable jaws and the trailer king pin. In operations where drivers are swapping trailers constantly throughout the day (and trailers are being dropped at different heights), I would be concerned about the possibility of a driver in a hurry either bending turntable jaws or jumping the trailer king pin over the turntable. Of course, none of these issues are new, European manufacturers have had to deal with them on their two pedal AMT's as well, and as a result they've been able to refine their clutch engagement as well retaining the option of a clutch pedal for applications where delicate maneuvering is required. There's no doubt that Eaton's Ultra shift plus is a quantum leap ahead of the old three pedal Auto-shift but it still has a way to go before it catches up to some of its more refined European competitors. 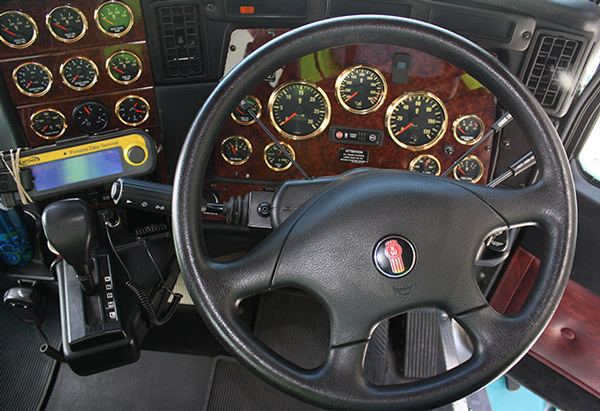 The narrow, cockpit-like cab of the prime mover is common to the rest of the Kenworth conventional range, and is not renowned for having much in the way of interior space. The narrow cockpit however, means that the driver is sitting virtually on top of the right-hand chassis rails, inside the wheel track of the vehicle. This reduces a lot of the lateral sway and bounce common to prime movers where the driver sits on top of, or in line with, the steer wheels. Visibility from the driver's seat of the T403 was actually quite good, another characteristic of the narrow cab and bonnet. A blindspot window and the daylight cut out of the doors left very little room for a motorist to hide. In terms of getting in and out of the cab, the Kenworth is pretty accessible. At a point in time where engine temperature concerns mean that trucks seem only to be getting higher off the ground, the 403 seems positively low slung. The wide side steps are well-spaced making cab entry a stroll compared to others on the market, there's even a token grab handle inside the cab A-pillar but I suspect that most would ignore it in favour of the steering wheel. Maybe it's just my delicate rear end but the Kab seat left a lot to be desired in the padding department, and after a few hours it had all the charm of an upturned milk crate, I'd definitely be ticking the box for an Isri seat on this one. 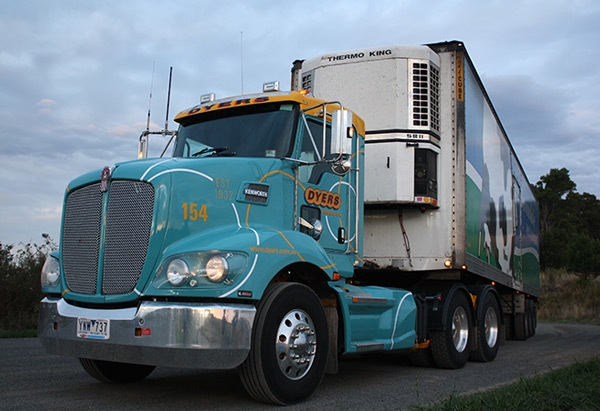 The distinctive Indian turquoise and yellow livery of Dyers trucks is a familiar sight on Victorian roads. 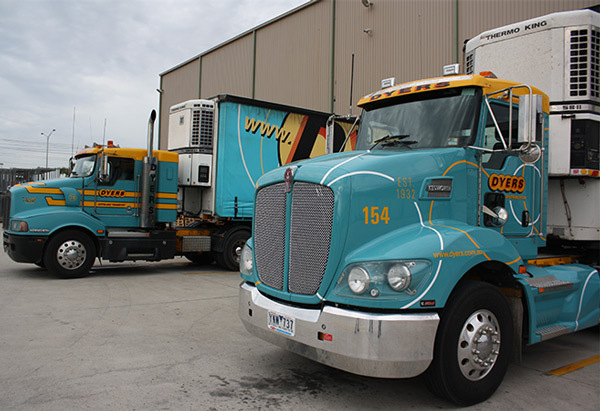 The Gippsland-based transport company has a history spanning three generations from 1932 and the Dyers prime mover fleet currently numbers in the vicinity of 100 predominately Kenworth units. 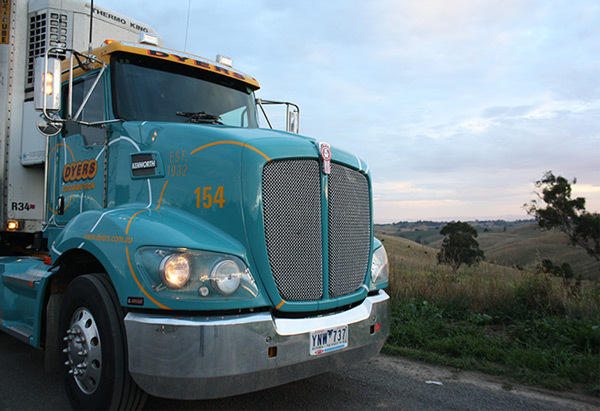 Dyers provides general, refrigerated and distribution services around not only the Gippsland region but Victoria-wide, with high profile customers in the form of National Foods, Murray Goulburn and IGA supermarkets. Dyers currently has depots in Laverton and Dandenong as well as its Gippsland depots in Morwell, Sale and Bairnsdale. A long-term Kenworth operator, Dyers took delivery of three T403's late last year all equipped with the new ISMe5 SCR power plant, and Eaton's 18-speed UltraShift plus automated manual transmission (AMT). Though these vehicles aren't covering vast distances, they are on the road six to seven days a week, and more often than not working a couple of shifts a day with rotating drivers. As a consequence, the nearly four-month-old prime mover I drove had already notched up 37,000km mainly running between the Latrobe Valley and Melbourne. It was a dark yet muggy 5am start when I met up with driver Cameron Both at Dyers' Morwell depot for the empty run over to Leongatha, where we would be loading out of the Murray Goulburn facility. Not being familiar with the road over the hills myself, Cameron took the wheel for the first stint as we rattled and bounced along the dark country road with an empty fridge pan behind us. Cameron has only lived down Gippsland way for a couple of years but confesses to enjoying the lifestyle this part of the world has to offer. Having worked on and off with Dyers over that period, Cameron says he's happy behind the wheel of the T403 and finds it has plenty enough grunt for the job at hand. With the sky lightening and the van loaded, I took the wheel for the run from Leongatha to Melbourne. With a gross weight of 40,200kg, only a couple of tonnes under the legal limit, the rough, undulating road proved to be a great chance to put the new Cummins through its paces. On first impressions the ISMe5 showed that although it may be an SCR powerplant, it's certainly no Euro motor, with a characteristic sound and feel that's every inch Cummins. And the red engine showed it was up to the task, pulling away nicely from a standstill and meandering through the streets sedately while the AMT did its gear changing thing. Once out of town with the go pedal down the 11-litre donk got down to business feeding power to the rubber until we were cruising at highway speed. Those who have spent time behind the wheel of a European vehicle may find the ISMe5 a bit harsh in responsiveness and its engine note abrasive, but those familiar with this type of prime mover will probably find that the Cummins performs much like any of its predecessors, with one notable exception, heat, or to be precise, lack of it. The fine summer morning was rapidly heating up but the 403, with its respectable load on board refused to lose its cool, with the coolant gauge maintaining a steady 80-85C. Heat, being the enemy of all things mechanical, has been the bane of the EGR engine's existence, especially in cab over vehicles. But a combination of a well-ventilated engine compartment, and the cooler running characteristics of the SCR motor meant that the 10-blade Horton engine fan only engaged on long pulls. Grades that would have had an EGR powerplant working up a sweat long before the ISMe5 decided it needed a breath of fresh air at 100C. Apart from the stress that excess heat can place on mechanical components, the less the engine fan runs, the less fuel the vehicle uses and the more available horsepower is on tap when needed. With the rolling South Gippsland hills scrolling past the windows, I was able to get a feel for the T403 as a package. The T403 is a great handling and riding truck that won't leave you feeling sea sick on the rough stuff. And there was certainly plenty of rough bitumen along the South Gippsland highway as a combination of summer heat and heavy traffic had taken its toll. We managed to get into town just in time for peak traffic and found ourselves either idling along the Monash freeway at a walking pace or sitting still admiring the view. Over the course of the next few hours, we made a delivery in Laverton, a pickup in Laverton, a pickup in Tullamarine before heading back to Morwell via Dyer's Dandenong depot. 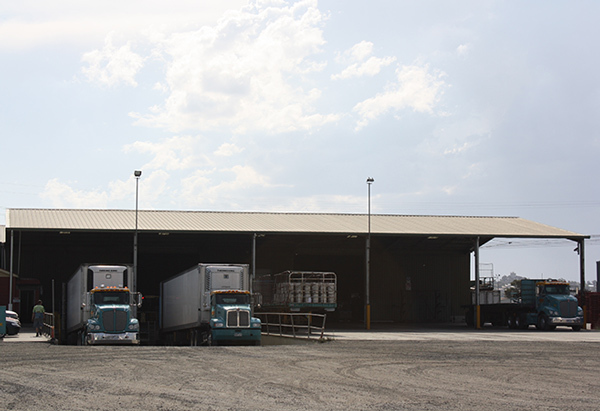 Metro distribution keeps a driver climbing in and out of a truck all day, and the Kenworth proved itself very easy to live with ergonomically. With the afternoon heating up and the green machine loaded, we left Dandenong for Morwell. Given the ambient temperature was in the low thirties and I had the air-conditioner roaring, the coolant temperature of the 11-litre Cummins kept in the high eighties to low nineties and once on the highway the Horton fan stayed off for the entire homeward run, a definite plus over its EGR predecessor. Most SCR engine manufacturers are claiming between 2 percent and 4 percent of diesel burnt DEF (Ad-Blue) usage. But they also claim a 2-4 percent improvement in fuel economy over equivalent EGR power plants. While some may debate this claim and also object to an added non-rebatable running cost, the reality is that the industry has no choice but to come to terms with DEF. When Euro 6 (ADR #80/04) arrives there will be very few new heavy vehicles running without it. The cruise back down the Princes Highway to Morwell was uneventful, arriving back at the depot under a menacing sky full of thunderheads. On the whole, the T403 was an easy truck to spend the day with. While not the most maneuverable truck in its class, the middle weight prime mover was, nonetheless, easy enough to punt around town while still retaining some highway manners. The ISMe5 was a punchy power plant much in the same vein as its EGR predecessor, maybe a little harsh for some but a capable performer all the same. It's also easy to see the red SCR motor having a place in diminishing load and engine intensive power take-off (PTO) roles such as fuel tankers, tippers etc. And other roles where the diesel particulate filter (DPF) regeneration process of the current EGR engine may be causing issues. This particular truck however seems to be perfectly at home in its role of regional and urban distribution prime mover. Great visibility for a bonneted Kenworth. The recent facelift leaves behind the 'budget' look of previous models. Handles well, both around town and on the open road. The choking cloud of dust that erupts from under the side mounted exhaust when on a dirt surface. I really wish someone could come up with something better than shaky old West Coast mirrors. Not a big fan of the Ultra-shift Plus gear box in this application. See all the content we have on Kenworth trucks, including news, reviews, specs, and trucks for sale.